I'm not sure exactly when it happened, but L.L.Bean has slowly become one of those stores I'm constantly shopping at - if you can tell from my Friday Finds, there's nearly always something catching my eye! I love the preppy but not overly preppy vibe, their fun takes on classics, the cute leather details, and the nautical vibes. I'm also crazy about whoever is picking out their color palettes right now - items like this sweater are so fun! I also love this windbreaker I got last fall - it comes in red and navy now, and I'm holding myself back from buying another! L.L.Bean also has some really great lookalike pieces for lower prices, like these shearling slippers that are almost identical to UGG's but for $70 instead of $120, or this sweater (I have a similar one that I love!) that's the same quality as a Patagonia but for $80 instead of $100. 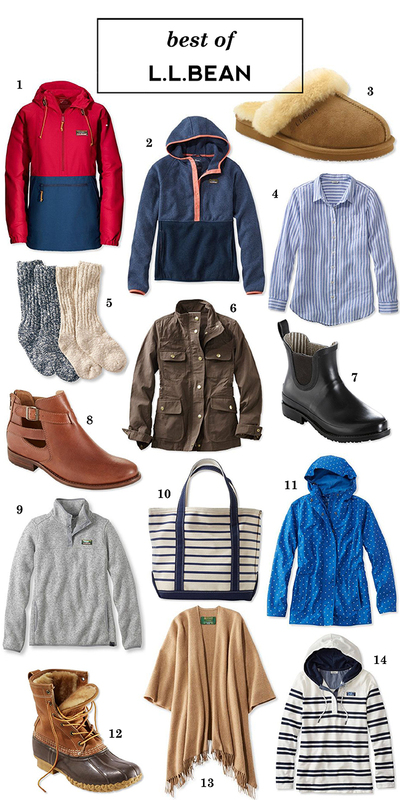 Plus L.L.Bean actually has sales! Also, I mean obviously, there are the boots. The Bean boots. I bought a pair of shearling-lined boots this fall, and it was probably my best purchase ever. I'm pretty sure I wore them every day during that super cold spell at the end of December (and several times a week since then too), and they kept my feet warm even in our crazy cold weather. If you're going to go for it, you have to get the shearling insoles too. They are the most amazing things ever, it's like walking on a cloud.